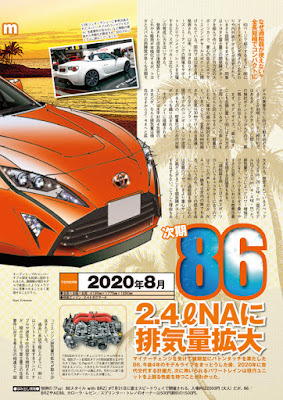 The recent facelift is going to keep the current 86 for four more years on the market, until August 2020 when the next-gen 86 will be introduced. The new model is going to be slightly shorter than the current model, measuring 4,195 x 1,775 x 1,290 mm, while power will come again from a natural aspired boxer engine. The engine will have a displacement of 2.4-liters and according to Mag-X, the power output will be increased by 31 ps (238 ps), while the torque will go up by 4.4 kgm (26 kgm).